One of the rehab activities suggested to us by the team in St Louis was indoor climbing. They had a 2 metre high wall in the physio room there which the kids would use for physio. Back in January I put in a call to a friend of mine, Maddy, who’s an experienced climber. Kindly, he took Rhys and I to the Westway climbing centre under the A40 so that we could give it a go. I figured that Rhys would get a couple of metres up, then fatigue and come back down – if we pulled that off it would have been worth the trip. Then this happened. It was, for me, a bit of a moment. Alright, Maddy was helping him a bit but he’d done most of the work himself. What impressed me the most was the new ability he had to control where he was placing his feet. It was genuinely a big surprise and impressed a number of Rhys’ physios here. A few weeks after that I went back to full time work and it’s been difficult to carve out the time to go climbing again. The days and weeks since have tumbled past so fast it feels like time has been concertinaed together, and now, somehow 12 months have passed since Rhys had his SDR on 28th June last summer. As much as going back to work makes things feel more ‘normal’ you can’t help but feel like you’ve somehow deserted your post. The question ‘did I do enough?’ rattles round in your head. That’s a common thought for many parents but it feels like it’s amplified a bit in these situations. In order to get a sense of what’s changed for Rhys since his op I have to cast my mind back to what we were thinking before his surgery. At Easter in 2012 Rhys was still using a buggy to get to school in the morning. It’s only about a mile away, but when you need to get there quickly there was no other way to do it. The problem was he was too big for the buggy so we were starting to consider getting an oversized one or a wheelchair. Neither were situations we really wanted to embrace, the underlying concern being that Rhys would, in time, go ‘off his feet’. Now though, Rhys has got that good at riding his scooter that he clips along almost as fast as any of his class mates. That’s quite a turnaround. Admittedly, walking that mile to school is still a big ask as he still trips and tumbles way more than his friends. But, you can’t help but feel we’ve gone from managing a decline to managing solid progress. I have to keep reminding myself of that when we have physio sessions that don’t go well. And thats another fact – that Rhys still has Cerebral Palsy. As much as he has new ability there will always be muscle groups that he really struggles to recruit. And the recovery from SDR is ongoing as well. When you look at the angle of his feet and legs there’s still a fair bit of inward rotation. So we’re still attending 2-3 physio sessions a week, and we’re still treadmill walking and stretching every morning before school. Another really neat thing though is that Rhys has learned to jump. Creating the power and control to spring off the ground was way out of sight pre op – now he can repeatedly jump his way round the house. He can also put a few jumps together on a trampoline now. Have a look at this video clip. 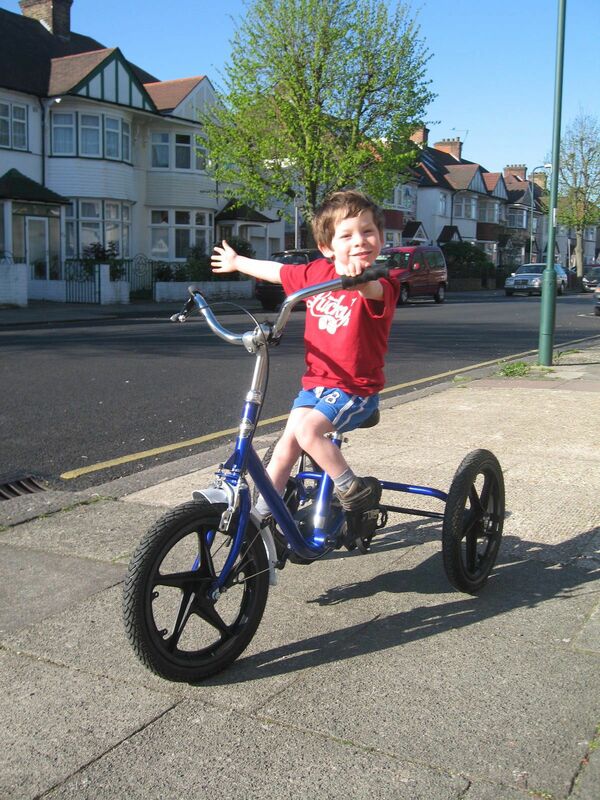 You may remember seeing this picture of Rhys on his trike. We’ve moved on from that now as well. Father Christmas brought Rhys a new bike with stabilisers. As the weather has improved we’ve been out practising on that as well. Here’s a video clip. Getting rid of the stabilisers will take a while but it feels like it could be achieved in the coming years. I like the idea of him riding to school – an appearance in the Olympic velodrome is less daft than it seemed last summer. There’s been other benefits beyond his physical ability. Rhys’ teaching assistant at school has often remarked that he’s also a more confident boy since his surgery. He’s more inclined to get involved in games in the playground than he was before. He goes to the drama club at school as well and they recently did a test where he had to recite a poem. Though I’d love it if he passes it, I almost don’t care what the result is. The fact that he was in there, barely a year after his SDR & cochlear implant, meant he was already a winner. As much as the SDR surgery itself made us feel anxious I was amazed by the technique and the science behind it. Many of the physios in St Louis have watched the procedure being carried out in theatre to aid their understanding of it. I remember saying to them that it must be fascinating to watch – they agreed that it is fascinating but that you wouldn’t want to observe your own child go through it – which I agreed with. Recently I found this video of Dr Park operating – it’s quite remarkable but definitely confirms what the physios had said. Watch it from 7 minutes in. Though we can’t be sure (the hope is that we should now avoid several rounds of corrective surgery as Rhys grows) we hope not. The worry was though, that this was on Rhys’ mind every night before bed. ‘Oh. Well can we go back to St Louis again?’. Which means that all the pain and frustration from last year has faded for him and he already looks back on it as a adventure where we met new people and went to new places. And that for me, combined with his new ability, means that all the anxiety and stress before and since his surgery has been worth it. So here we are – Happy SDR Birthday. It’s getting close to being 12 months since Rhys had his surgery in St Louis and in the coming weeks I’ll write a post about how he’s doing. In the run up to his op lots of people asked me ‘Why isn’t SDR available on the NHS?’. There was a heap of reasons and I wrote about it here in a post from September. At that stage the issue had been raised in Prime Ministers Questions with David Cameron being asked directly about the availability of SDR. That all came about due to the persistence of a group of parents that make up Support4SDR UK. Since then they’ve continued pursuing government ministers, writing letters, picking apart illogical arguments put in their path until they met today with Norman Lamb MP, Minister of State for Care and Support. Incredibly, he’s been persuaded to take action on several fronts. It’s an amazing result and it feels as though the availability of SDR on the NHS in England has just got an awful lot closer. It’s also a tribute to the sheer persistence of a small group of dedicated parents determined to create a change.